Deputy Commissioner of Police, Rohini, SD Mishra said the police control room received a call about the incident at KN Katju Police Station at 1.04 am. 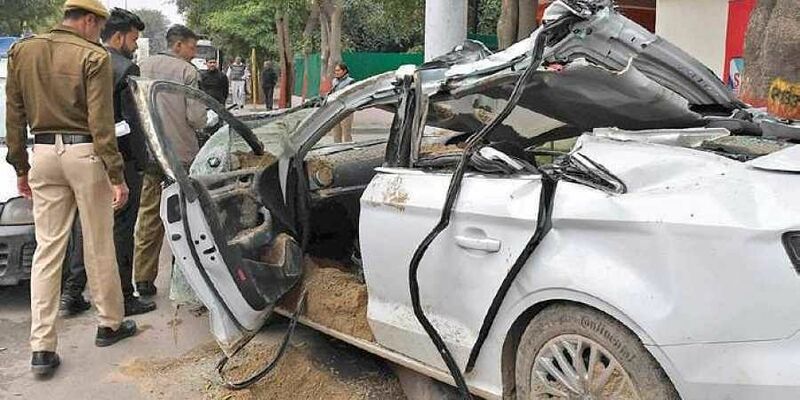 NEW DELHI: Three people of a family died and a four-year-old child was critically injured after a sand-laden dumper overturned and collided with their car early on Wednesday, police said, adding the accused driver was arrested. “The incident took place at KNK Marg, opposite ESI Hospital in Sector 15. On reaching the spot, the police found that the Audi, with four people on board, was completely smashed under the weight of the truck. The driver of the dumper fled the spot but was tracked down later,” the officer said adding that the family of four was immediately rushed to the hospital. The DCP said that the man driving the luxury car was 29-year-old Sumit. While Sumit, his 27-year-old wife Ruchi and 65-year-old mother Reetu were declared brought dead at the ESI hospital, the couple’s four-year-old child was critically injured and his currently undergoing treatment. The victims were residents of Rohini, Sector 15, in north Delhi. “The family was on the way back from an engagement party,” the DCP said. The DCP said that the incident is currently under investigation. “Prima facie, it seems the dumper overturned while taking a U-turn at high speed and rammed the Audi,” he said. According to the police, the speeding truck was overloaded. A case under relevant sections of the Indian Penal Code was registered against the driver of the dumper. He has been identified as 48-year-old Harpal from Haryana’s Sonipat. Though he fled the spot in the wake of the incident, a police team tracked him down. His vehicle was seized.